As the current semester winds down on April 25, there will be changes in the library hours at both Chilliwack and Abbotsford. May 9-August hours will be posted later! Detailed library hours are available here. 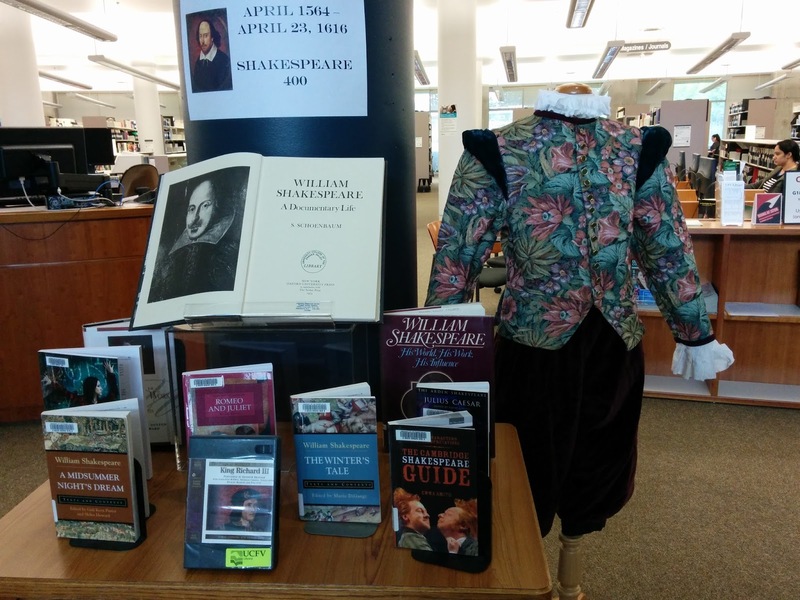 April 23, 2016 marks the 400th anniversary of Shakespeare's death, and the UFV Library in Abbotsford has created a display to celebrate the event. Please drop by and take a look! Here are some fun websites as well. This problem is now being reported as RESOLVED. Many libraries, including UFV, are experiencing problems opening e-books provided by EBSCOhost. The problems seem to occur when using Firefox or Internet Explorer. A possible solution for now is to use Chrome or Safari as your preferred browser. EBSCO is aware of the issue and is currently working on a solution. There are no problems opening books from our other e-book vendors, including ebrary, Sage and myilibrary. We apologize for the problems this may be causing our users. Posted by Patti Wilson, April 15, 2016.